I often sign up for online classes as I love learning new techniques. But, I do not always make the doll during the online class, lol! Recently I decided to tackle an online class that I had signed up for a year ago, a mermaid by Angela Jarecki, called "Enkai Nou", Japanese for deeps or ocean, gift or memory. 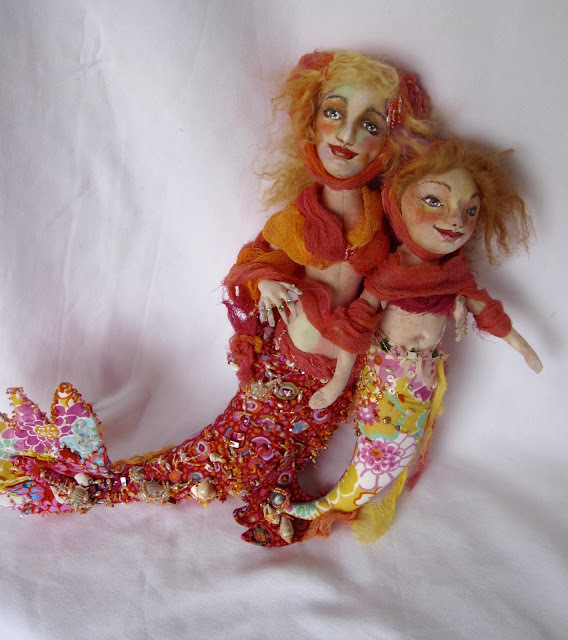 My mermaid piece is called Marina, Italian for sea and the child is Gemma, gift or jewel. 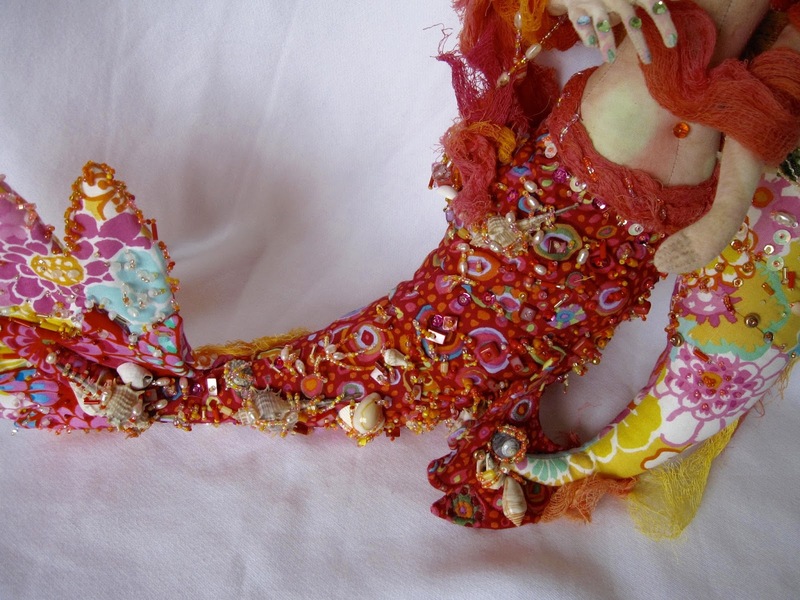 Now I went to town beading the mermaid tail and fin. I also added real shells to the piece. Notice that I made the child mermaid as well. 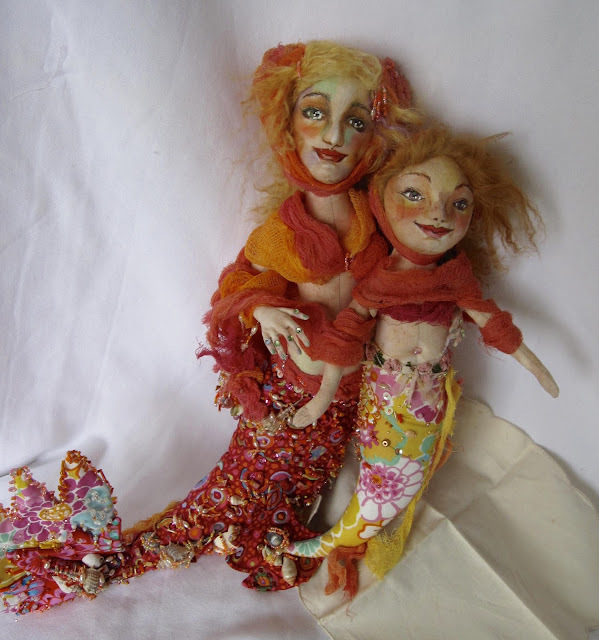 The eyes on the child are farther apart and the face has less colouring than the mamma mermaid. 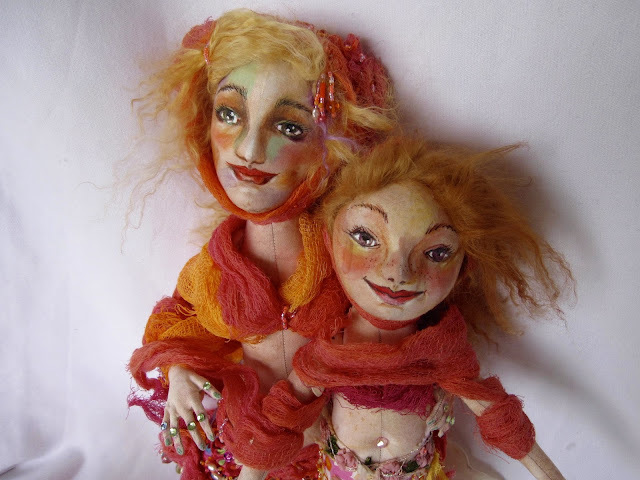 I used the same fabrics for both dolls, just in a different order. I love the way they turned out. I hope you enjoyed this duo as much as I enjoyed making them. I love online classes as I always learn so much and it stimulates me to create! 2017 has started with a lot of sadness and sorrow. In the span of two weeks I lost my beloved mom (aged 86) and a dear friend (aged 77). I took solace in my creative life and I made a second Frida. I call this new piece, " Embrace the Shadows"
In life to fully appreciate the light, we must embrace the shadows-the sorrowful, the dark can have great power. But if we embrace the shadows and remember the light and joy that our loved ones brought us, then we can continue to celebrate life and our loved ones by embracing all the rich tapestry of our life and our surroundings. Time is precious and death is the final call for us all. I used Arley Berryhill's pattern, "Candlestick Diva" as my starting point. I wanted a larger head to emphasize the shadowy side of Frida. I had purchased the fabric a year ago with a Frida doll in mind, and it was perfect for the skirt. The iconic Mexican folk print celebrates life and brings hope to the piece. 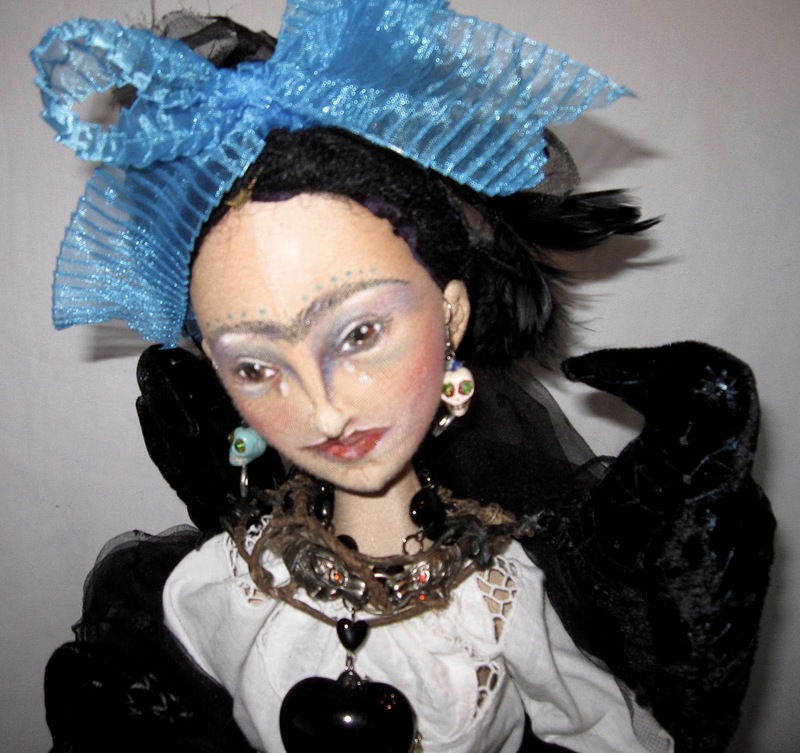 Frida's hair is black yarn, braided in her typical Mexican folk art style. I added crocheted flowers to the back along with black feathers to symbolize sorrow. Frida stands 25" tall and so has quite the presence. 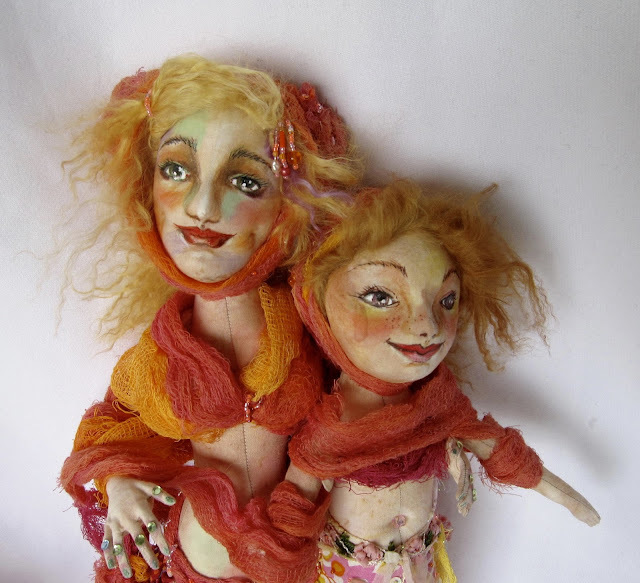 I am very pleased with the finished piece and it helped bring joy back to this dismal year! I hope you enjoy her. 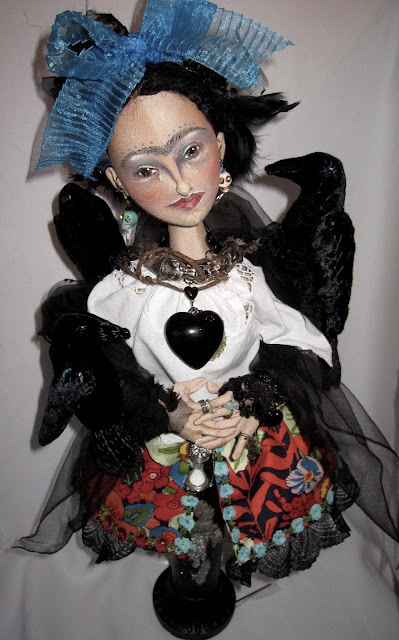 The three crows are made from black velvet and her earrings are a nod to the day of the dead.